It's no secret that the Harriet Miers nomination has brought out inherent tensions within the political realm of Blogosphere. The reasons why that is have less to do with the rather nondescript lady herself: in fact, it's amusing to contemplate anyone getting really worked up over her. It's not necessarily about Miers' persona, or even her politics -- although it could have something to do with her being a cipher to date. We just don't know that much about her. And when you have a vacuum like that, the normal tendency is to fill up the void. In Blogosphere's case, and indeed, around this country -- it is a void eagerly filled with opinions: pro, con, but decidedly never lukewarm one way or another. Why is this happening to the Blogospheric centre-right, especially, and why now? (c) Bush blinked, in the now famous words of SCOTUS observer for CourtTV, Fred Graham, and echoing William Kristol, editor of The Weekly Standard. Instead of showing leadership and vision, he showed caution and fear. And we all know, when you show weakness, you don't get pity. You get attacked. Some may suggest that it has to do with distaste over cronyism, or more precisely: one Bush crony appointment too many. Also, at no other time were those in the centre-right more attuned to the various legal candidates out there, than now. You couldn't move for all the Luttigs, Browns, Jones, McConnells, Estradas, Owens, Garzas references, ad infinitum, which barraged you the moment you read certain blogs. Before long, you understood that we're living through a golden age of brilliant originalist legal minds, molded in the post-Affirmative Action/Roe v. Wade era. So you got the impression that everyone had a horse running in this race, with a dozen systems on how to handicap it -- only for ashen-faced bettors to realise their thoroughbreds didn't even make it out of the gate. That really must've hurt these massed cognoscenti. More likely, it also has to do with the amazing credentials of his previous candidate, now Supreme Court Chief Justice, John G. Roberts. Looking at him sometimes, it was almost as if central casting had found the perfect American man for the highest Court in the land. Just young enough to be appealing to all demographics. Just old enough to have some professional weightiness. True, another void who never revealed much, but who showed loads of promise -- in every way the perfect SCOTUS nominee. In the words of old vaudevillians, that's a hard act to follow. And suddenly, in walks the dog act: Harriet Miers. As you can see, very few people take this no doubt worthy lady seriously. The anti-Miers memes are not about politics, or ideologies, or even allegiances, but about her apparent dearth of credentials, giving her a serio-comic aspect which people are only too happy to exploit. I once remarked that certain people lend themselves better to ridicule, and for whatever number of reasons, she is one of them. There was no immediate John G. Roberts blogspoof created, for example, as there was with Pope Benedict XVI, even. But there is a very hilarious Harriet Miers one, almost within the hour of her public nomination. And of course, the supposed Smoking Gun of her intellectual abilities. For those to whom this nomination to the SCOTUS meant a lot, in fact, forming a top-tier reason why they voted for President Bush in 2004, the nomination of Harriet Miers instead of those above-mentioned jurists, was a bucket of cold water. People realised that the President had been handed a gift of a second-term, which are usually best known for their lame-duck quality because of the impossibility of re-election, which he could then transform, if nothing else, into a Supreme Court bonanza. Sandra Day O'Connor had always mentioned privately to her friends that it was her intent to step down during the term of a Republican president, if at all possible. And then came the announcement of the serious illness of Chief Justice William Rehnquist. Even though it may seem callous, there were many primed to believe that there would be two openings in the SCOTUS before long -- and indeed, there soon were. Two precious appointments which could influence a generation, and perhaps, the entire future history of this nation. It literally made certain people feel giddy with its possibilities, especially with the 5-4 SCOTUS decision to confirm George Bush as 43rd President of the United States still fresh in many people's minds. Now add to that scenario both Houses of Congress on the Republican side. Imagine what could happen for the traditionalist, libertarian, "Religious Right" or dexter aisle of American society if that all important swing vote could transform itself into a solid originalist vote. Another Scalia or Thomas! Free at last, thank God almighty, we're free at last...of the Warren Court! Possibly no other reason of why people wanted to make doubly sure this appointment was a no-doubter was because Republican presidents have had shocking bad luck in their SCOTUS appointments in the past. The self-same Earl Warren was an Eisenhower appointee. And the President's own father appointed David Souter, that special bugbear of the right today. The list is endless, and frankly painful to them. But it's not that certain people wish to have judicial automatons, without a single, independent, intellectual spark of their own on the Supreme Court. It's just that they feel that a President has every right to appoint someone whose understanding of the law mirrors the world view of those who elected said President. That's the whole point of the pendulum political process, which swings in one Party's direction one time, and towards the other, the next time. Appointing the justices who will rule on decisions brought to the SCOTUS is arguably the most important plum of being US President. In the balance of powers, and checks and balances the Founding Fathers left as a legacy to this country's system of governance, the chance to appoint a nominee is almost a way of picking illicit fruit in this forbidden systemic orchard. Although a part of the Executive branch, a President is DIRECTLY influencing, in theory, for a brief moment, the path of the Judicial branch. He can mold that path as he and his advisors will. So when a SCOTUS appointee goes a completely different direction than the one which had been anticipated by an administration, it leaves that President and his supporters looking like babes-in-the-woods. And it's certainly not been lost on anyone that in recent times, that foolish aspect has mostly belonged to the Republican presidents. One certainly has never heard any Democrat complain of the surprising, even treacherous tack taken by, say, Ruth Bader Ginsburg. Conventional wisdom had it that the brilliance of John Roberts was a good counterbalance to the edginess of not really knowing much about him. And by and large, he skillfully held his peace about his views, invoking the Ginsburg Precedent, silkily frustrating the Democratic Senators of the Senate Judiciary Committee. Yet, in fact, the Republicans should also be a bit worried. Roberts hinted in the confirmation hearings that he is more in the mold of a Rehnquist, whereas most of those on the right just flat out wanted another Scalia or Thomas. Two. Two appointments, though -- a thought people hugged to their hearts. Fine. One down, one to go. Thus his co-rightists gave President Bush the benefit of the doubt with Roberts. It was enough that his personal ethos hinted at originalist thinking, such as being a member of the Federalist Society for a time. But the second nomination had better be, in the language of baseball which seems to follow these two nominations like Superglue (vide John Roberts' analogy of a justice being an impartial umpire), a homerun. Far from being a homer, any number of commentators the hours after Miers was announced, were not charry to mention this last nomination had been nothing more than a bunt. For people primed for a swing-for-the-fences attempt, at least, it felt as if the game had suddenly been called after the first pitch. President Bush is that rarest of men -- in his person, he attracts a wide swath of voters who may merely lean towards his side, than actually share all his perceived convictions. The one reason he can do so, is that he was the perfect Presidential candidate for the perfect political time. Moreso than in 2000, in 2004, President Bush reunited people by being an "evangelical, tough on terrorists, solid convictions, and personal moral standing candidate", who furthermore reflected in his ethos his country's ideals of individualism, work ethic, religiosity, and respect for the idea that is "America". The other candidate just floated. He stood for nothing that you could hang your hat on and say, "that's what he believes in, 100%". It's possible that Republicans may never have such a confluence of people attracted enough by a single candidate who stood for ALL the values they did, for a LONG time. Ronald Reagan might have attracted born-again Christians, but he wasn't especially religious. Nor were Nixon, Ford, or Eisenhower. That's also true of the President's own father, GHW Bush. And it's the social conservatives that gave President Bush the 2004 election. But suddenly, with one mere Miers appointment, people are starting to question just what his real intents are, and if those convictions are truly as rock-solid as they appeared just 11 short months ago. It would seem ludicrous to most to question if he is genuinely religious, and Pro-Life, as he has intimated on many occasions that he is. This after a PBS Frontline documentary called The Jesus Factor, which is self-explanatory by the title, and on the heels of a BBC documentary which claimed Palestinian officials had been told by President Bush that "God" had told him to go to war in Iraq (which the White House promptly laughed away as so much twaddle). This guy means it. It's not an act, just to get elected. His convictions may be controversial, but they are genuine. 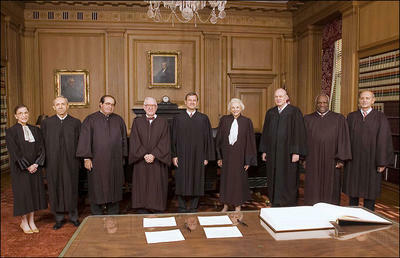 And when it came to overturning Roe v. Wade, especially, when he had the chance to appoint an originalist, clear and simple, he merely appointed someone who is a Christian evangelical like himself, but one whose views on the matter have changed since the 1970's, when she was more Pro-Choice (not to mention, a Democrat). And people think, if they changed once, they could change again. Or, at the very least, they could be influenced to stay the course, a la O'Connor. That's the great fear here. And that fear was placed inside people by the very man who was supposed never to invoke that anxiety -- certainly not on that topic. "At the end of the day, does he want certain decisions overturned, yes or no?" Since the thought is too unwelcome for words, suddenly people are double-guessing, and triple-psyching out this nomination. "Maybe it's another nefarious but brilliant Rovian plot, which will catch the Dems by surprise, ya think?!" The thing of it is, it was always the other side which had to jump through these conspiracy theory hoops -- not his own side. And once that seed of doubt is sown, it'll be that much harder to make it merely a bad move like many past moves could be called, such as the immigration issues, the spending issues, and even the war issues. It's now, oh dread word, a possible pattern. Politics makes for strange bedfellows, is one of the oldest truisms invented by man. It reflects the oddity of having to forge alliances with people who may not otherwise share much in common, but who find themselves mingling with each other, even forming ertswhile partnerships, for a brief moment in time. That moment was particularly acute in American politics in 2004. Various people who would not otherwise have voted for President Bush before, suddenly found themselves making a pragmatic decision to do so. The future of the country was at stake, moreso than at any other time since the end of the Cold War. The comforting pre-dawn fog of the 1990s was over. Here comes shock-and-awe of the third millennium to wake us out of our reveries. But, as ever with alliances, it's composed of actors who may suddenly decide it's not worth being a part of the play anymore. That's a calculated risk many Parties take, such as Germany's Grand Coalition which made Dr. Angela Merkel, the first woman Chancellor of Germany on 12 October. Coalitions are not an American tradition. They would fail for lack of belief in what they stand for -- which is a little bit of that, and a little bit of the other. And a whole lot of nothing. Blech. But just like the American left-wing is often seen as an umbrella of groups, who often present a rag-and-bobtail front in demonstrations, so too do the right-wing of American politics, even if you won't usually find them at protest marches. The following is just a small roundup of groups which co-habit inside the modern-day Republican Party. It's quite possible that there are more. In fact, it's a certainty. SOCIAL CONSERVATIVES -- It's easy to confuse this category with the soi-disant, Religious Right. But not all social conservatives are religious, or consider themselves to be a part of the evangelical or indeed, Christian movement. There are many Orthodox Jews who would fall into this category, for example. One reuniting factor for those who are social conservatives, however, is ease in invoking traditional moral values. With emphasis on hard work, respect for authority, and structure of the family, these Republicans were often the most overlooked sector (until Bush came to power), but indefatigably the most active grassroots-level of conservatives. PALEO-CONSERVATIVES -- Often formed by very unsavoury members of the right-wing. Here one runs the gamut from "Angry White Males", like the John Birch Society, to anti-Semites, to sexists, to xenophobes or anti-immigrants, to the less morally egregious, but still extreme conservatives, like isolationists in the stripe of the Pats Robertson/Buchanan, and Juan Cole. Militia members, United Nation skeptics, and those who believe in protectionism rather than the free-market system, are all in this category. They're called Paleo because of the dinosaur-like, anti-modern status of their beliefs. Ironically, it is this President that finally wrested control of the Republican Party from the Paleos, allowing ever more people to now align themselves with the GOP, which before they felt they could not. NEO-CONSERVATIVES -- They believe the United States should be pro-active in meeting conflict before it arises. Their foreign policy is the opposite of containment, and they feel that spreading democracy is the single-most important foreign policy objective this country should have. Neo-Conservatives are often not the least bit interested in religious questions, and though the free-market is lauded by them, their emphasis is not economic. Apart from a belief that the US is a force of good in this world, they are ideologues with no real ideology. LIBERTARIANS -- Libertarians believe in the least possible interference of government into the private sphere of citizens' lives. As such, there are many (often superficial) resemblances between true Libertarians, and modern Conservatives. A healthy suspicion of authority, represented by the federal government and its agencies makes it easier these days for Libertarians to make the Republican Party their political home. Libertarians are also the ones most interested in originalist jurists, since their convictions are best held up by those who believe government should not legislate from the bench. Often, it's been the Libertarians like Instapundit and Ann Althouse who have been the most disappointed by the Miers appointment, on Blogosphere. "MUGGED BY REALITY" LIBERALS -- They're still liberals in their sensibilities, and probably always will be. But 9/11 made them look at the world, and thereto, their Parties with new, jaundiced eyes. Slowly but surely, they didn't recognise particularly the Democratic Party, as being tough enough to lead the country if attacked. They'll continue to vote Republican, but possibly will not if these rules change. EX-LIBERALS TURNED REPUBLICAN -- It's not just David Horowitz and Michael Medved who are the ex-liberal wolves in conservative sheep's clothing anymore. Since the 1980's especially, a lot of people left the Democratic Party in spirit. The process is always gradual, and not as dramatic as Winston Churchill crossing the aisle, or Zell Miller giving the Republican National Convention speech. Sometimes it is quite secret, in fact, barely admitting it either to one's friends, relatives, even really to oneself. But it happens. You're now a Republican. And sometimes that reason is that you didn't leave that other Party: it left you. Unlike Libertarians, and "Mugged by Reality Liberals", they won't go back to being Liberal no matter what. BUSINESS / CORPORATE / FREE MARKET CONSERVATIVES -- From small-businessmen and women of the mom and pop variety (still 99% of all business in the US), to Chicago School of Economics professors, to corporate behemoths, these conservatives believe that the business of America is business. Making a profit is no bad thing to these people. On the contrary, it's a boon for all concerned. Globalisation seems a perfect fit for these Hayek-lovers, but they often have to fight a battle to convince people that jobs leaving the country is a good thing ultimately. PRO-MILITARY CONSERVATIVES -- People (including their families, and supporters), who lay their life on the line tend to be patriotic, and it's true that patriotism exists most comfortably in the Republican Party, albeit you certainly don't have to be a Republican to be patriotic. It's just that there is a greater ease in expression of military pride than exists in other Parties, in the post-Vietman era. You won't find flag-burners here. Nor will you find people who believe in an isolationist America, by and large. Their duty is very clear: defend America, protect America, represent America, in good times or ill.
NASCAR DADS / SOCCER MOM / SUBURBAN CONSERVATIVES -- These archly middle-class suburbanites often turn to the Republican Party because of its family-friendly values. The soccer-mom demographic was also 14 points higher to Bush than to Kerry, than it was in 2000, precisely because many of these mothers transformed themselves from soccer-moms to security-moms. When you look at a map of the US, and see the blotch of Red in the middle in 2004, you will see the Midwest Suburban Conservative Effect at work especially. SOUTHERN OR RURAL CONSERVATIVES -- The Party of Lincoln is no more anathema to these Southern men and women. Dixiecrats share much in common with the category above, Ex-Liberals turned Republicans, but in fact, pure Dixiecrats, once they got rid of the stigma of supporting the Party which fought against them in the War or Northern Aggression, were really always Conservative in scope. Controversially, their beliefs about the Civil War have less to do with slavery, than with deep loathing of being told what to do by the Federal Government. When the Great Society stumbled, they turned in droves after the 1990's towards the Republicans, making it a very potent demographic for all Parties concerned to court. LOG CABIN REPUBLICANS -- An underreported, and perhaps undervalued section of the Republican Party, these gay Conservatives find no contradiction in being Republican and being gay, simply because it's a Party which tends to have lots of social conservatives in it. Many Log Cabin Republicans are quite wealthy, educated, connected and active in their hometowns, adding a very committed-to-Republican ideals section to modern Conservatism. MINORITY REPUBLICANS -- From Cuban-Americans, to black Americans like former ambassador Alan Keyes or Dr. Condoleeza Rice, as well as the targeted Mexican-American demographic, who helped to overpass African-Americans themselves as the second most populous ethnic category in the US, these Conservatives find it easier to belong to the Republican Party than to the Democratic Party because of a plethora of reasons. With Cuban-Americans, it's the Republican tough-talking/acting towards Communism that attracts. With African-Americans, it's often religious or shared values inherent to the Party, which is certainly true of other minorities as well. With Jewish conservatives who are not social conservatives it could be that since the Republican Party has most visibly aligned itself with Israel, they feel increasingly more comfortable now in the GOP (the Canadian-born, David Frum, is a case in point, as are Paul Wolfowitz, and Richard Perle). This is a very wide category of conservatives. ACADEMIC / INTELLECTUAL / JOURNALISTIC CONSERVATIVES -- It's sometimes a lonely proposition, to be an academic of right-leaning politics or conviction, in many campuses today. Because of this philosophical isolation from their peers, academic conservatives have taken to blogs like eager fish to water. Yet others, eagerly seek out the publications of known intellectual conservatives like Victor Davis Hansen, Daniel Pipes, Jean-François Revel. Possibly many of these writers fall into other categories as well, such as Oriana Fallaci, whose deep disgust over Islam has made her books into a cause-celebre on two continents, even though she's always been a committed Socialist. The journalist/writer, Christopher Hitchens, may now also be included in this category, albeit like Fallaci, his poilitcal sensibilities started and may still well be on the other side of the aisle. Whatever else this may suggest, this category is one of the fastest growing in the centre-right world. SINGLE-ISSUE REPUBLICANS -- It could be gun-control. It could be pro-Life. It could be Globalisation. It could be gay marriage. It could be many issues, but these Conservatives are more likely energised by just the one all-encompassing issue, that makes them vote the way they do. It's possible that many people above and below feel strongly about other topics too, but this is the determining factor of why they choose to vote Red over Blue when their hot-button is at play. GEN X-ERS -- Alex P. Keaton is all grown up, and he can vote. Many times US Gen-X'ers' politics were formed as a reaction to their more liberal, 1960s/70s era of parents. The values and arguments of their parents' generation are often not their own. Nostalgia for another time runs high in Gen-X'ers, thus affecting their viewpoints in politics. As many so-called Millennials (those born post-1980) are allegedly as conservative as many Gen-X'ers are, it might be a pattern of political allegiance that may yet survive one generation, as they themselves did not with their own parents. It's obvious that the more categories people identify with, the more of a Conservative they tend to be, and the opposite is also certainly true. What the Miers nomination did was to expose some of these apparent tensions and contradictions, not only within the Republican Party, but within these groups themselves, especially as represented in Blogosphere. 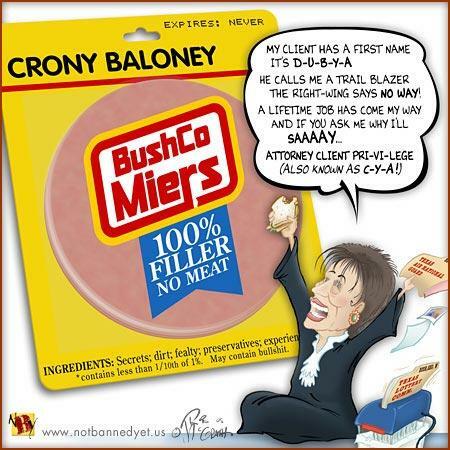 The Libertarians, as an example, and the Social Conservatives, two of the most influential blocs within the GOP, were equally chagrined by the nebulous quality of Ms. Miers' background and lack of readily identifiable credentials. And it's no surprise that the centre-right legal bloggers were the most vocal in opposition, as a recent poll showed. They probably were intimately aware of the choices, and stakes, as Constitutional Law is a very select field. For as you can see by these many examples, the modern Republican Party is a House of Cards. Take out any one of these cards, and you might have a collapse of the tenuous balance it goes into sustaining it. The very least the current President can do for his fellow conservatives, they say, is to make sure the cards he deals them, are not stacked against his own. Who knows if maybe, there is not yet a 3rd or even 4th chance given this President for a SCOTUS appointment. And into that will come all the variables listed above, AND the new ones created by its own dynamics. Only this time, the participants will be a little more wary of the hand. IN THE COMMENTS: A past shrewd commenter is confident President Bush will withdraw Miers' nomination, whilst another hilariously likens Miers to "New Coke". UPDATE: The Anchoress notes the contradictory positive reaction David Frum had in July, to a possible Harriet Miers nomination. She is quiet, discreet, intensely loyal to Bush personally, and - though not ideologically conservative - nonetheless firmly pro-life. Plus she’s a woman. Double plus - she’d be a huge surprise, and the president loves springing surprises on Washington and those pundits who think they know it all. It's devastating because David Frum is now leading the anti-Miers charge by a petition-drive to get her nomination withdrawn. Unless something dramatic happened, it makes him look either duplicitous, or uninformed then, making people ask why should we trust his opinions in future? But there will be a second chance at this second chance, I now think. I've also gone through the blogpost with a fine spellcheck comb. I hope it's now presentable, and clear of mistakes. Not the conclusions, which are my own, but the facts. I don't think so, although I continue to defer to your ever-accurate political instincts. If it the Miers nomination is shot-down, it'll reflect even worse on the President than it does now. And what is the entire purpose of this little charade, if it is that, to begin with? As I mentioned, if it's some Rovian scheme, what possible purpose could it serve but to raise doubts and suspicions were none existed so baldly before. Therefore, I think it truly was a "straight" nomination, without conspiracy scenarios at work. If it was the latter, however, it was botched up royally by all concerned. Blogosphere is still the preserve of a few. Yes, there are probably millions of readers of blogs, especially political or current affairs blogs. But when I asked my parents, who are very well-educated people, what they thought of Miers, they didn't bemoan the Luttigs, the Owens, the Jones' being passed over. They just want to hear her opinions during the Hearings themselves. I think a lot of Americans outside of Blogosphere are going to wait before passing judgement too. It's not only "us" that are making a big stink out of this nomination, but let's just say -- we're very concentrated on it. JSU may be right, there may be a second chance at this second chance! Miers' nomination reminds me of The Coca Cola Company replacing Coke with the New Coke. The outcry that followed forced them to bring back the original Coke as Classic Coke. New Coke quickly faded. Miers may be New Coke. Another fine piece of analytical work! And an enjoyable read, I actually read the whole thing, unlikely on many other sites. I felt for decades, as did many others, I'm sure, that power in this country rests within the Federal courts because of their lifetime tenure and they reflected the philosophy of whoever appoints them. As opposed to all other judges who are elected and can be voted out. I stood in a small line in 2000 to elect President Bush predominately with the Supreme Court in Mind. In 2004, I stood in line for three hours almost solely in fear of what Kerry might do to the Supreme Court. I rejoiced when The President was re-elected. I have not rejoiced over Roberts, nor do I do that over Miers. I feel sold-out, if anything. I am several of the descriptions you enunciate, neo-conservative, Libertarian, Pro-military, at least those and I feel no matter what decisions he has made for his day to day running of our country, he has devastated it by backing away from a fight which he could win or lose, but a worthy fight still. He should have nominated people whose decisions over their lifetime show their leanings. He has not, it seems. I hope, ten years from now, people who may laugh at my fears now are still able to laugh. I'd like that. Victoria, sorry for using up space, I promise not to comment for three days. It won't be shot down. It will, if we're at all fortunate, be withdrawn. As for the whence, read John Fund's disturbing account. Btw Vic, I thought you didn't know many local Republicans? Democrats and independents are just bystanders on the outcome of this one, I'm afraid. I'm still not sold on this happening, unless Harriet Miers herself decides to withdraw her name (certainly, though, with pressure from the administration). This made my new blog-feature: In the Comments. You deserve a big smooch, or a cookie. The choice is yours. I think many people feel that way, as you say. I know I do, and SCOTUS and other judicial appointments (every bit as important as that to the Highest bench) were a determinant factor for voting the way I did in 2004.
almost solely in fear of what Kerry might do to the Supreme Court. I rejoiced when The President was re-elected. Paul, thanks. I was meaning to add just below those categories, that people of course find themselves ticking off more than one category, if they are Republicans reading it. I added that to the post. I also corrected the hideously laughable misprint of "pro-gun-control" to anti-gun-control (!). and I feel no matter what decisions he has made for his day to day running of our country, he has devastated it by backing away from a fight which he could win or lose, but a worthy fight still. As you say, the thing of it is, people like Bush because he's a fighter. Whatever else, he never backed away from a tough defence of what he believes in. That made him unpopular with some, but hugely popular with others. This Miers nomination and its immediate buildup, has brought that image crashing down. As an "old" Historian, I have to say, it's almsot certain that what we feel now, will be almost unrecognisable in a decade. That's what happens when people write memoirs, and you have a certain distance from the heated events of the day. And you know, Paul, I love that about History. Thanks for reading it, and taking the time to comment. Ack, JSU. I just read that article you cited. Or she might have said. "That's very flattering, Mr. President. Maybe another time after I'm in another job. But right now I need to keep my wits about me and give you the best possible advice I can about the other candidates. That's my one and only job, and I don't want to blow it." Who in their right minds is going to turn down the US President when he's actually offering you a SCOTUS position -- using these words! Even if the impulse is what is important, and not the words, Fund (whom I saw plastered all over the news entities the days following the Miers nomination) shows a complete lack of psychology. 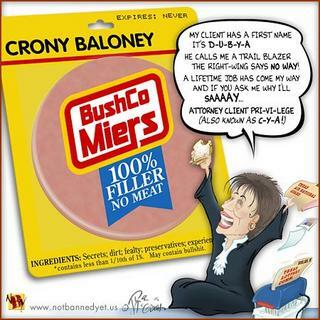 A spinster lady, ex-Bush-lawyer, with no family, and no real ties to Texas. You offered it to her, she would accept, it's that simple. "It was a disaster waiting to happen," says G. Calvin Mackenzie, a professor at Colby College in Maine who specializes in presidential appointments. "You are evaluating a close friend of the president, under pressure to keep it secret even internally and thus limiting the outside advice you get." But then Fund suggests an internal audit in the WH to make sure this kind of thing doesn't happen again. What pristine world does he live in? Presidents appoint their close advisors to high position every day! If we start to call for internal audits all the time, you can be sure that Presidents will have their hands tied in future when selecting nominees for any position. We'll just get watered down, mousey candidates, which are not supposed to raise any hackles in confirmation hearings. "It was revealed that over 80% of people in the short list for the SCOTUS, told the WH staffers to withdraw their names from consideration"
Wrong. That's White House spin, as relayed by the unfortunate Dobson. In fact, the names most commonly floated for "withdrawal" -- Owen and Karen Williams -- explicitly denied it after the rumor spread. The more plausible rumor is that Miers herself sandbagged these other candidates with false information (like the "Batchelder is an activist" howler Brit Hume let out the other day). This, unfortunately, makes her graceful exit now less likely. Oh dear. Thanks for the info. That really gives everything another flip for me, yet again. The more plausible rumor is that Miers herself sandbagged these other candidates with false information (like the "Batchelder is an activist" howler Brit Hume let out the other day). A Christian evangelical with ambition! Why not indeed. This, unfortunately, makes her graceful exit now less likely. This is like choosing Harriet Miers as the 1st round draft choice of your favorite NFL team. John Roberts was LaDainian Tomlinson. But dammit, Harriet Miers is nothing more than LaBrandon Toefield...ouch. You're welcome. I'll be headin' South for my smooch! It Is! I ran a search, nothing. Probably me, I'll keep trying, thank you. Victoria, I love History and agree very much. What worries me, sometimes, is that revisionist History may be what reaches our students - but while saying that I instantly wonder what is True History. I have a specific matter in mind. Who gets to say? You know words like these and writing as you do, only encourage me. Thank you very much. Ah, slandering Frum. How about first reading what he said just before the nomination? I believe I was the first to float the name of Harriet Miers, White House counsel, as a possible Supreme Court. Today her name is all over the news. I have to confess that at the time, I was mostly joking. Oh my God, if it's possible, this article makes him look ever worse. Because he doesn't deny that he mentioned Miers by name as a possible candidate, but merely states he was kidding about it. An ex-speechwriter to the President. A noted analyst and commentator. Just kidding! Haha, David! You're SUCH a card. The only thing is, we're not laughing. P.S. : JSU, it's libel not slander, since it's written. But actually, by his own admission, it's not... Alas. I have a specific matter in mind. Who gets to say? As Winston Churchill said, "History will be kind to me, because I intend to write it". History isn't ultimate Truth, as I learnt at University to my sorrow, Paul. I'll read it, enjoy it and most likely believe it. That's just it--and it depends on which card gets taken out. You simply can't please all the factions all the time, but some are more willing to accept differences than others. Case in point (besides Miers): immigration. The blogosphere is full of people shrieking about "immigration" (while not having any solutions or IMHO, no idea of what the Bush policy actually is), but they completely miss--or ignore--the fact that many of us agree with Bush's immigration policy because of the various things that factor into it. They just want a big wall put up on the border, and that's that, and then vilify Bush for not doing what THEY want. Nevermind (or never KNOW) the Republicans who are getting "what they want" with the Bush policy. It's notable that those who are the most strongly anti-Miers (other than the lawyers) are the same ones who are angry about Bush's immigration policy. It's also notable that they think THEY are "the base" and THEY "elected Bush," when clearly neither is the case--I've worked at least as hard for conservative candidates and causes my entire adult life, but that doesn't count in their eyes, because I am loyal to the only party that can meet my needs, and don't call Bush a "traitor" when I don't agree with a particular policy. Some of us just accept the fact that we aren't always going to agree, and others can't accept it. BTW, immigration policy isn't a pet issue of mine, I'm just using it as an example because it seems to pop up in so many anti-Miers comments.